IVAACast is the official VA newsletter of the International Virtual Assistants Association (IVAA). The publication of the Virtual Assistants’ industry only professional trade association, IVAACast, brings relevant and industry specific articles to the Virtual Assistant profession. IVAACast is published ten (10) times per year by the IVAA and distributed to over 11,000 subscribers worldwide! 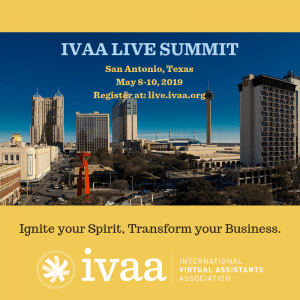 Stay updated on current IVAA news and events as well as information on both our Online and LIVE Summits – Conferences geared to the Virtual Professional.